Caritas is a Kent-based chamber choir, passionate about raising money for charities through singing, and performing to the highest level both in the UK and throughout Europe. The choir performs music from all periods and often features in services at Canterbury Cathedral. 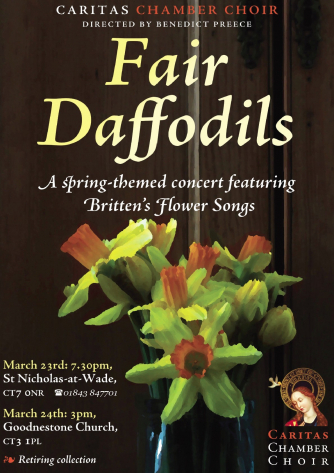 This concert will look at musical versions of the well-known Robert Herrick poem, amongst a varied programme including several 20th century British composers as well as contemporary choral work, including a World Premiere - see the village website for more details.